Before I continue, Danny Choo has been generous enough to hold a competition. The goal is to upload your desk area, the criteria to win is… who knows? For any of you who are curious enough to wonder what my work area looks like, wonder no further! Behold! The Madness of Moé! UPDATE: Thanks to Danny Choo! Seems like I came runner up! OMG, I never saw a picture of your room before. o.0 It looks like a puzzle to me. I can imagine you placed your figures on the desk for the photo, but your wall and ceiling are always decorated by the posters. Nice! The photo is truely amazing, looks really otaku. I like it. Yo Aya, congrats for winning. Now use your prize money to buy better furniture & get your figures out of your moe favela. 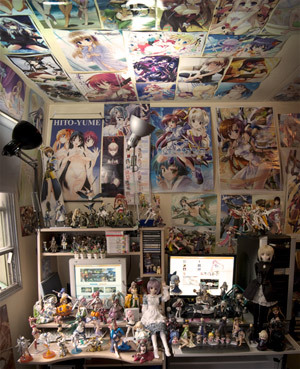 Oh wow… My first reaction at seeing that picture on DannyChoo was basically “is there ANY wall space left uncovered in this guy’s room?” and then I started scrolling down…. and about the time I saw Yuki and Saber the gears started to turn. “Waaaaiiit….I’ve seen this before” lol. Congrats on coming runners up. The posters on the ceiling makes the room look so good! That, and I realize that some shops sell what look to be 1/3 scale electric guitars, but I can’t be certain. Cost anywhere from AU$40-60, though, so they’re not cheap. valhos last blog ([site]) post – Merging blogs…. I’m still reeling over the fact that I actually won something lol! Just a shame that I don’t have much time to devote to this site like I used to, curse you uni work!! and this may be late but congrats.